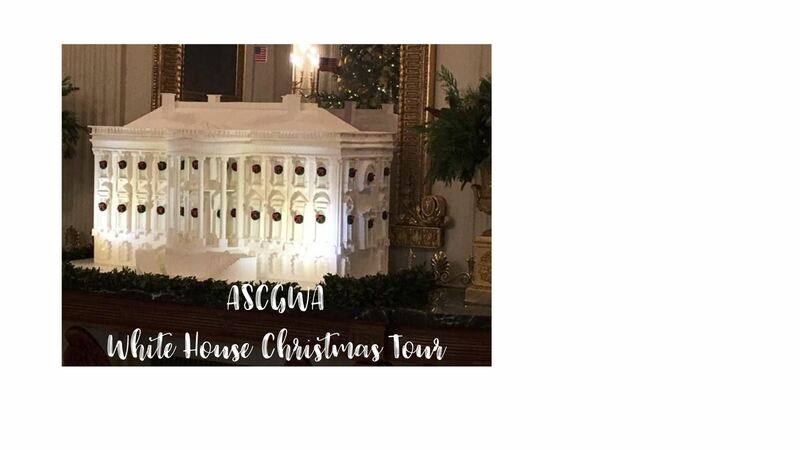 ASCGWA is excited to share an opportunity to tour the White House this holiday season! We have secured White House Holiday Tours thanks to the support of Congressman Phil Roe of Tennessee. Late registrations and cancellations will not be accepted by the White House Tour Office so please be certain you can attend before you register for a spot. The tour will take place between 7:30 am-1:00 pm. Registrations will be confirmed after Wednesday, September 26, 2018. You will receive the official link to register for the tour after our registration closes. You will enter your personal information via the White House link, NOT on the club website. Instructions will accompany the email. Pending final approval from the White House ASCGWA will receive our tour time a week to two weeks prior to the tour date. There are no exceptions to the RSVP deadline. The White House controls the registration and security screening. Once your registration has been submitted, you cannot make any edits to the request. This tour is for paid, current ASCGWA club members. It is important to understand that even though we have a confirmed tour window, due to circumstances out of our control such as schedule changes at the White House, our tour may be canceled at any time. When completing your registration via the White House link, you MUST provide your Social Security Number or other identification (Internationals) for a background check to be completed by the Secret Service. The Secret Service has the right to deny anyone entry if they feel it is in the interest of National Security. ASCGWA does not have any control over security requirements or tour changes and we thank you in advance for your patience.